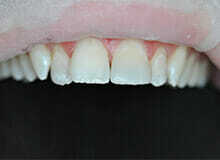 Immediate veneers are used to close midline diastema (front tooth gap/spacing) to make wonky teeth look straight. You’ll notice that the new front teeth blend with the existing natural teeth, which is the ultimate goal, in this case, to create a natural looking smile. No teeth were harmed in these photos! 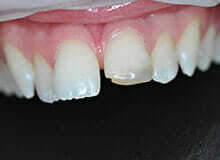 The technique is known as minimally invasive or even micro-invasive, where teeth are built up with composite material and a particular layering method.